After the manic actions of the hares, you might enjoy the calmer pursuit of finding wood anemones (Anemone nemorosa), which appear in-you guessed it-woodland. Known as a “primitive flower”, having only sepals in its flower instead of petals, but none-the-less lovely for it, the wood anemone is a member of the buttercup family. Year-round the plant lies unobserved, having no foliage and resembling a root (or rhizome), until late February, when it bursts into a delicate white flower, with a yellow centre. 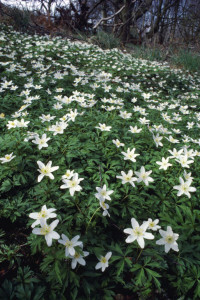 According to gardening experts, the wood anemone is relatively easy to grow, requiring only compost and sunlight. The anemone is one of Britain’s earliest flowers of the year, and if the conditions are correct will populate areas rapidly. To grow your own, pieces of rhizome should carefully be broken off and replanted. This should reward your garden with hopeful flowers, following the sun in its progress across the spring sky. 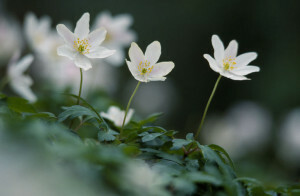 For the non-gardener, wood anemones can be seen throughout March in most deciduous woodlands (the only exception being those with acidic soil). Best to look on sunny days, as they are inclined to close their flowers when the weather is overcast. Wood Anemone. Image by Laurie Camobell. The anemone has a rich mythology, and often conjures images of astronomy, as its flowers are distinctly star shaped. Like shooting stars, the flowers are short lived, appearing in early spring in a glorious white bloom, and returning to the soil before the summer sets in. As a writer, the wood anemone gives me great satisfaction in its attractive collection of nick-names, including Nightcap, Wood Crowfoot, Wind Flower, Smell Fox. It is a flower which links the gardener or nature lover back to early civilisations, and their reactions to the spring. The Ancient Greeks believed that the flower sprang up from Aphrodite’s tears, when Adonis died, whilst the Romans celebrated the first bloom as a protection from fever. The name ‘anemone’, comes from the Greek Anemos, who was the God of wind, a nice image to have in mind when being buffeted about the countryside in the blustery days of March.